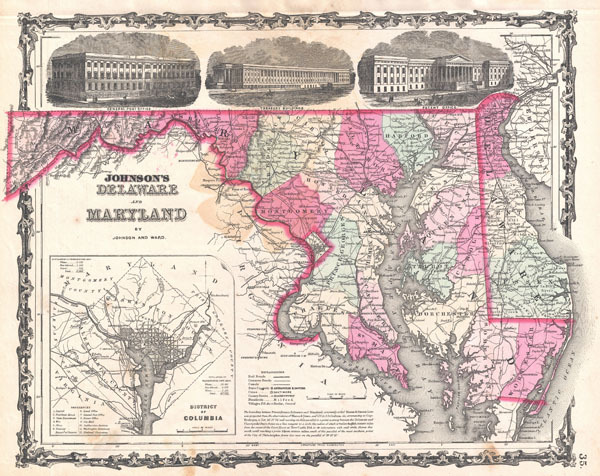 This is A. J. Johnson's 1862 map of Maryland, Delaware and Washington D.C. Covers both states as well as the capital district in considerable detail. This is the most decorative of Johnson's Maryland-Delaware series with three inset views along the top as well as an inset map of the District of Columbian the bottom right corner. Most earlier and later editions of this map remove these decorative elements. Offers color coding according to county and notations for railways, roadways, cities, towns, and river systems. Engraved views along the top of the map detail the 'General Post Office,' the 'Treasury Building' and the 'Patent Office.' At the bottom center there is a note regarding the work of Mason and Dixon surveying the Maryland - Pennsylvania border. Features the strapwork style border common to Johnson's atlas work from 1860 to 1863. Published by A. J. Johnson and Ward as plate number 35 in the 1862 edition of Johnson's New Illustrated Family Atlas. This is the first edition of the Family Atlas to bear the Johnson and Ward imprint. Very good condition. At some point, someone pressed a four leaf clover between the pages of the atlas, leaving a discoloration in this form near Monggomery County, Maryland. Else clean.